"Young people want to break the rules," said the 21-year-old, his fingers speckled with paint. "We want to see more interesting things on the street or on the wall, so we do graffiti to express ourselves," he noted. Kong belongs to the growing ranks of graffiti artists in Ho Chi Minh City, where subcultures - BMX biking, skateboarding and breakdancing - jostle for space on the hipster scene. For many the spray can is a tool of rebellion - illicit spray-painting is a way of defying restrictions in a country where artists must have their work approved before exhibitions, shows are routinely shut down and works deemed controversial are replaced by a black "X" on gallery walls. But the young artist knows better than to dabble in politics, opting instead to paint playful images less likely to incur the wrath of censors in the nation. Yet many artists like him believe there is something almost political in the very act of spraying a wall - and rejecting parents' expectations to find a stable job. But his parents didn't approve, hoping instead he might find a steady office job. "They still don't like it... they think it's a dangerous game and it's bad for my health because of the spray paint," he said with a chuckle. Ho Chi Minh City is now a graffiti hotspot, thanks to pioneering artists - both local and foreign - eager to fill blank wall space. 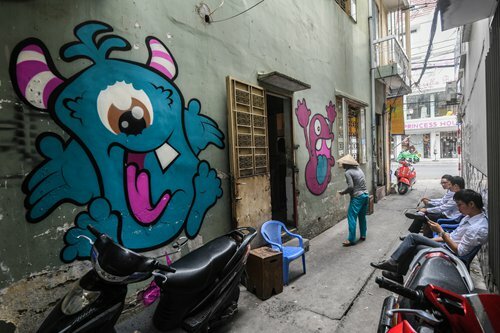 "It has become a part of Saigon, you can't imagine Saigon without graffiti," said independent curator Nguyen Nhu Huy, using the city's former French colonial name. Today, the city has several hubs for graffiti and street art, such as "3A Station," a collection of colonial buildings that were reportedly occupied by the CIA during the Vietnam War. The walls are bursting with color and plastered with art - including Kong's wide-eyed primate and a massive rooster wearing sunglasses - luring tourists taking Instagram-worthy selfies. "The government doesn't like us... They [used to say] that we make the walls dirty, but the people like us so we do our graffiti," he said. One mural promoting environmental safety was defaced in the central city of Danang, though the artist doesn't know who took issue with it. "In school they've been taught how to think and what to think, so I think there's some ingrained censorship for sure," said Dan Nguyen, a California-born Vietnamese artist and DJ who moved to Ho Chi Minh City about five years ago. "Now the city is growing up, development with a lot of building, a lot of security, so it's really hard for us to paint masterpieces," said Daos. Hemmed in by towering high-rises on all sides, the colonial properties home to "3A Station" have been sold to real estate developers hungry to get their hands on the valuable downtown land. Though heartbroken, 3A's coordinator Mai Do believes Ho Chi Minh's graffiti culture will grow, even after her space is gone, as artists are finding new spots showcase their work. She noted, "That's a good way for them to survive."